Michael Suddard: Should Church Events have Free Admission? Should Church Events have Free Admission? Last year my church put on a good evening of music and entertainment. Church members performed, the audience participated and special guests were brought in to play the pipe organ and play instruments. The reviews were positive from those that attended. A "free will offering" was collected following the show. Basically, offering plates were put out and people could drop off a donation if they so wished. The plates, following the show, overflowed with donations from those that attended. 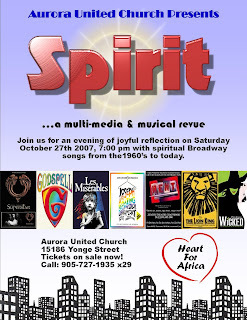 Coming this October the church is presenting another concert featuring music from several past Broadway musicals. However, this year instead of a "freewill offering" there is a ten dollar admission charge. To some ten dollars for admission to a show is pretty cheap. Considering that Theatre Aurora, the local volunteer community theatre, is presenting a play with an admission charge of fifteen dollars, ten dollars is not too bad for an evening of entertainment. However, what about those that are unable to afford the ten dollar admission charge? Should these people be left out of a night of enjoyment? Churches usually runs on support of the community and, in turn, return the support to the community as much as it can. Part of supporting the community in this case is opening the doors of the church to the wider community in order to share the talents and hard work of the church members. That is what happenned at last years show. Audience members were not forced to pay an admission charge in order to see the show. Audience members at last years show were not forced to put anything in the donation plate as they left the show. In contrast, this years show requires audience members to purchase tickets before even attending the show. Perhaps the admission charge is to ensure the music and special guest performers are properly looked after financially. However, this didn't seem to be a problem following last years show being paid for through "freewill offering" methods. In fact after last years shows expenses were paid there was money left over that was put back into the arts program at the church. So why the admission charge this year? Will I be attending this years show? At this point I'm not sure. I support the terrific arts program at my church. But, it seems, based on the admission cost, the show is meant for the middle to higher income people who can afford a ten dollar admission charge So I'm thinking of not attending in sympathy of those who could not afford the admission price as well as the belief that churchs shouldn't be charging a set rate that all could not afford. However, I do believe if approached, the organizers do have the hearts of giving tickets to those who could not afford them. But there is the principle of churchs allowing those to bring forth what they can. In other words the Little Drummer Boy didn't have anything to offer what would newborn who would one day become the 'King of Chrstianity.' However, he did bring forth his ability to play his drum. In the case of the show, perhaps someone would like to see and here the music of Broadway, however they are not able to afford the tickets to this show. Shouldn't the church, out of the spirit of charitable Christanity offer these people the tickets for free or at a rate they could afford? Perhaps this is the case, however, the postering that admission is ten dollars would seem ominous to those who might not be able to afford it and who don't want to go through the prospects of pleading for tickets. How could this whole situation be solved? Either offer the show for free to community or bring back the idea of freewill offering after the performance. Then perhaps those that could least afford it would feel welcome to attend. Sure they might not drop a nickel in the plate but perhaps they would be able to help pickup the leftover programs and clean up after the Sanctuary after the show. This would match the spirit that the Christmas carol so personifies, those offering what they can for the betterment of the Jesus or in this case the Community. Now isn't that what churchs are all about in first place? The church should not be charging admission prices but taking up freewill offering afterwards. This would allow everyone in the community to attend the show. Churchs are built on the support of the communities. Thus, I believe churches should give back to the communities whenever possible. This includes opening the church doors to support groups, sales and even entertaining shows whenever possible. However, running a church does cost money and some money needs to be raised. But the raising of funds shouldn't shut out those who can least afford to give as they are part of the community support as well. Hence the placement of a plate for those to freely drop a donation in is great especially for a show. This is because following the show positive reviews usually result in plenty of money coming in from those that enjoyed themselves. Also, if the show this year is anything like last years, the money flow will definately not be an issue and those that cannot afford to pay may also feel part of the both the church and the community. And if churches are able to make a everyone feel part of it and the community, positive reviews are more likely to occur.